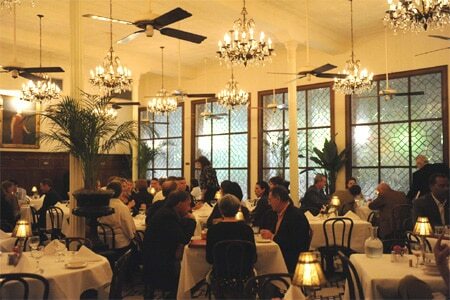 Arnaud’s offers classic French Creole fine dining. About the restaurant: Arnaud’s is cavernous and elegant, but the early 19th-century main dining room, with its huge expanse of etched leaded glass, is where you want to dine. Guests routinely spend three hours at the table as if nothing else mattered. Swiftly moving tuxedo-clad waiters glide along the patterned ceramic-tile floors; they bear pots of café brûlot emitting blue flames and the aroma of citrus, liqueur and spices. Likes: The classic Creole cuisine. Food & Drinks: The chef is as adept with seafood (the pompano en croûte is singular) as he is with meats (we suggest the sweetbreads). The signature Shrimp Arnaud --- giant prawns served cold with a spicy rémoulade sauce --- vies for attention with another Arnaud's creation: oysters Bienville, baked with green onions, herbs and seasonings in a white wine sauce. Airy pommes de terre soufflés (oblong bubbles of fried potato) may be enjoyed alongside an apéritif. Classic Creole sauces, enriched with cream, wine or both, flow freely. Elaborate desserts include Strawberries Arnaud, marinated in port, red wine and spices and topped with Angelo Brocato’s ice cream. A restaurant of Arnaud’s caliber deserves a long, well-constructed wine list and this one does not disappoint. Service is polished and attentive. The glossy-wood French 75 Bar offers a fine selection of cigars and liqueurs. If this is your first visit, you will want to tour the Mardi Gras Museum upstairs.